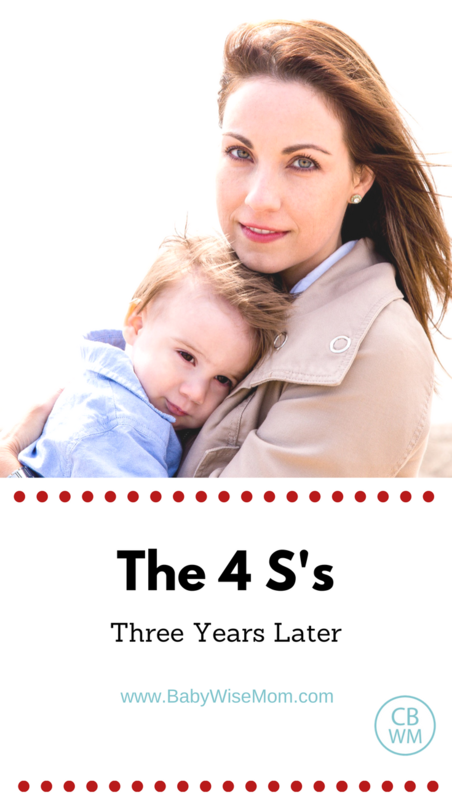 When McKenna was a baby, I used Tracy Hogg’s Four S’s to help her sleep (though we only used the first three). It seemed to really help her settle in for sleep peacefully. When I shared about us using it, a reader commented about it seeming to be a bit more of “a production” than she wanted, and another reader wondered how this would translate long-term. Well, McKenna is now three years old, so I thought I would post about the 4 S’s from the perspective of her being an older child. I really liked our 3 S’s we used and I plan to do them with my next child. I continued to hold McKenna with her face over my shoulder while I sang her sleep-time lullaby until she was around 2.5 or so. I was amazed that every time we went into her room, I held her like that, I could literally feel her body relax just like I did as a newborn. She was instantly ready for sleeping. I found this to be fabulous because toddlers are often very wound up for nap time, so it was great to have something like that to calm her and prepare her so quickly. Once I became pregnant, I knew that this wasn’t something I was going to do as a large pregnant lady, so I started putting her in her bed while I sang instead of holding her. She has done just fine! She sleeps great and hasn’t protested at all with the change. And so my conclusion is that this action of the 4 S’s did not create a sleep prop. It was beneficial not only for a newborn, but for a toddler as well. It didn’t cost me any more time than I would take to put her to bed anyway. Therefore, I find it very valuable in helping your newborn baby to sleep. It is definitely not a move I regret making, and it is a move I intend to repeat. See Sleep Training: The Four S’s for more. Next Post Poll Results: WHAT AGE DID YOU MOVE TO A BOOSTER SEAT AT MEALTIME? What lullaby did you use? (I know it's not in the lullaby you use, but the 4 S's.) I'm just curious, trying to pick something I want my child hearing everyday. Oh I found the answer under sleep routine. Twinkle Twinkle little star. I completely agree that it is a great way to quickly calm/relax a toddler who is used to this routine. My son is 22 months and I have done this for him since he was a baby. He relaxes so quickly and usually asks to be laid down before I even finish singing an entire lullaby! I am 9 months pregnant and it still works with him and my huge belly :). Naomi, I have used a different lullaby for each child. Brayden was "lullaby, and goodnight, sleep tight my baby"–I can't remember the actual name. Is that Brahm's Lullaby?Kaitlyn was Twinkle Twinkle.McKenna was a song from my church's primary songbook for children. Love the 4 S's. I seem to be following Baby whisperer a little more than baby wise, we used the pu/pd method and the 4s for sleep training. When we go in for nap and bedtime Jax relaxes and seems to know the routine. He is Sooo easy to put down. We sing Jesus Loves me for nap times and read a book for bed times. I love the 4 S's. They were a life saver for me. I couldn't stand doing CIO with my boy and when I stumbled on the 4 S's I was so relieved. At 8 months I can lay my baby boy in his crib, sing him a song or two and leave the room without him protesting. It's been that way since we started. Love it! Thanks for the update! I've used Hogg's 4 S's on my now 14 month old boy, and it worked well for us. To be honest, I'd kind of forgotten about it, but in a way it's still there in our routine. He settles down in much the same way it sounds like McKenna does. In fact, once his body relaxes, he really wants to be in the crib rather than be held. Sometimes sooner than I would like 😉 They grow so fast. Mrs. Madz, that is great to hear! You are one of the few people I have heard from who have liked the PU/PD. Austyn, they do grow so fast!